Houston teens, come wax poetic, be prophetic. Be lyrical, sincere-ical. Fight the repressive, get expressive. 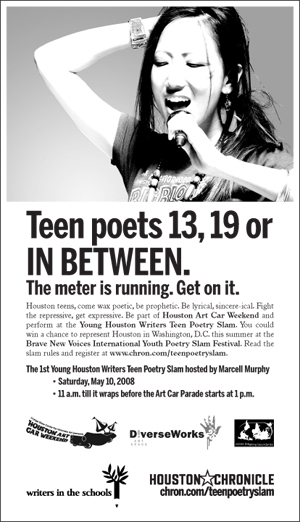 Be part of Houston Art Car Weekend and perform at the Young Houston Writers Teen Poetry Slam. You could win a chance to represent Houston in Washington, D.C. this summer at the Brave New Voices International Youth Poetry Slam Festival. Read the slam rules and register here.